Service metric count displayed in the service summary and details・User’s timezone settings etc. The days have finally started to warm up a bit. But with the warm spring weather, comes the annual battle against allergies! Here is this week’s Mackerel update. Until now, the total was displayed from the plan detail screen, but not together with the service value. With this update, the service metric count is now displayed in the service summary screen and the detail screen. This will make managing the service metrics easier. 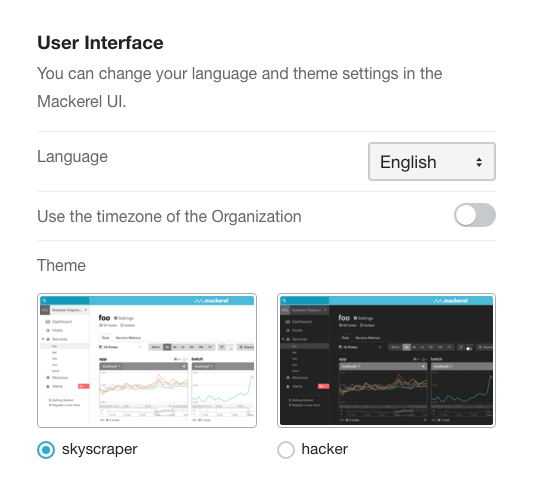 In Mackerel, it has been possible to designate the time zone in the organization’s settings. This is used by alert notifications, and until now, graphs and such that were displayed depended on the timezone of the location of the user’s device. With this update, the user’s environment is no longer a factor. Every time displayed on the screen can now be unified with the organization’s settings. From the User Interface screen, switch on “Use the timezone of the Organization” to use this feature.